An unexpected break...I’m having a hard time staying motivated to blog. I do have recipes I need to post and I have certainly had the opportunity to do so, but I just haven’t. The same goes with staying updated on my GR. I have so many unread posts in there, some of which are from my favorite blogs, but I just can’t get motivated to even read them. Anyway though… Last year the TWD bloggers posted this fabulous Peanut Butter Torte, it was right before my birthday and I decided it was going to be my birthday cake. Sadly, I was a bit insane last summer taking 17hrs and working full time so I didn’t have time to make it. This year however, GAME ON. I’m not taking any classes this summer, only working (and AHHHH! I only have 1 month left of that!) So I have much more time. So my birthday came around a couple weeks ago and it was a fabulous day. I took the day off work, went on a nice run with the husband followed by a mani, pedi, massage, a nice big piece of this torte, happy hour and the cinema suites at the new Mainstreet Theater here in KC. It was the absolute perfect start to the big 2-7. I never ever get to relax, so a little pampering is just what I needed. The Torte is amazing…. to die for, absolutely perfect, fabulous, creamy, super rich, chocolaty, peanut buttery with a hint of cinnamon, espresso, and nutmeg that just gives it a little kick. It’s one of those desserts that you go to sneak a bite of before your meal and somehow end up devouring an entire piece. I took some of this into work and it was very well received. I was told I have to make it again before I leave. The recipe is very simple to make. I made the crust and filling one night and then the ganache topping the next day. This dessert is definitely one of my favorites and will be made again and again! Getting ready: center a rack in the oven and preheat the oven to 350°F. Butter a 9-inch Springform pan and place it on a baking sheet lined with parchment or a silicone mat.Toss ½ cup of the chopped peanuts, the sugar, espresso powder, cinnamon, nutmeg and chocolate chops together in a small bowl. Set aside. Put the Oreo crumbs, melted butter and salt in another small bowl and stir with a fork just until crumbs are moistened. Press the crumbs evenly over the bottom and up the sides of the spring form pan (they should go up about 2 inches on the sides). Freeze the crust for 10 minutes.Bake the crust for 10 minutes, then transfer it to a rack and let it cool completely before filling. To Finish The Torte: put the chopped chocolate in a heatproof bowl and set the bowl over a saucepan of simmering water. Leave the bowl over the water just until the chocolate softens and starts to melt, about 3 minutes; remove the bowl from the saucepan.Bring the remaining ½ cup cream to a full boil. Pour the cream over the chocolate and , working with a a rubber spatula, very gently stir together until the ganache is completely blended and glossy. Pour the ganache over the torte, smoothing it with a metal icing spatula. Scatter the remaining ½ cup peanuts over the top and chill to set the topping, about 20 minutes.When the ganache is firm, remove the sides of the Springform pan; it’s easiest to warm the pan with a hairdryer, and then remove the sides, but you can also wrap a kitchen towel damped with hot water around the pan and leave it there for 10 seconds. Refrigerate until ready to serve. Last week I must have been in a Mediterranean Mood. I made Mediterranean Chicken Salad and this Mediterranean Pasta Salad. I was looking for a recipe that was easy and flavorful and after looking through quite a few sites I stopped at RecipeZaar. My biggest regret with this is that I forgot to buy fresh basil and parsley so I was stuck using dried. Don't get me wrong, this was absolutely fabulous and full of flavor, but I can just imagine what fresh herbs would have done. Besides the flavor from the dressing, I loved the all the veggies and feta, it was just so good. (sadly I didn't get a good shot of the veggies. Believe me, it was very pretty!) Oh and the artichokes, I just love artichokes. The process of making this is easy but long, it's not something to just throw together after work and eat for dinner. That's kind of a pain but it really allowed the flavors to marry. We had this the first night on a Tuesday and it lasted the rest of the week for lunches and dinner. The next gathering we go to I will definitely bring this. I think it will be a big hit with a crowd! It would also be wonderful with some chicken or steak - something I will definitely add next time. In a large serving bowl, toss together the pasta, onion, cucumber, bell peppers, celery, olives, and artichoke hearts. Pour 1 cup of the dressing over the salad and toss Refrigerate the salad for at least 6 hours. When ready to serve, toss the salad with the remaining dressing. When I got the May 2009 issue of BHG and saw Fresh Strawberry Bars on the cover I knew they were right up my alley. Recently I've become a sucker for anything strawberry. I also knew I needed to make sure they didn't stay around my house long. I wanted to bring them into work, but one of my coworkers is allergic to Strawberries so I kept putting them off. Last week that coworker was out of town so it was my chance to make them. The dense peanut butter base of the bars is the perfect compliment to the sweet strawberries. It almost tastes like the freshest, gourmet PB&J sandwich you've ever had. I got a TON of compliments on these. They were everything from "Oh this reminds me of the pastries I used to eat in France" .... "Oh wow this is the best Peanut Butter and Jelly I've ever had" ...."Wait, you MADE those??" "Oh my gosh, this is delicious"... and last but not least "scrapescrapescrape" (The sound of people scraping every last bit off their plate.) Matt was also a huge fan of these and exclaimed "WOAHHHHOMYDISOGOD!" (That's Woah! Oh my gosh this is so good! With his mouthful.) I really appreciated all the compliments and they made me laugh because the recipe is incredibly easy. All in all I say this is a perfect summer time dessert. I highly, highly recommend it! Heat oven to 350°F. Line 12×9x2-inch baking pan with foil, extending foil beyond edges. Set aside. In large mixing bowl beat butter and peanut butter on medium to high for 30 seconds. Beat in sugars, baking powder, and salt until combined. Add eggs and vanilla; beat until combined. Beat in as much flour as you can with mixer. Stir in remaining flour. Spread dough in prepared pain. Bake 25 minutes or until top is lightly browned and toothpick inserted near center comes out clean. Cool completely on rack. Remove from pain by lifting foil. Spread jam and top with berries. Cut into bars. Serve at once or refrigerate up to 6 hours. Makes 24 bars. **What I did was made the base and cut and topped 4 individual bars to take my pictures. I wrapped the rest in foil and the next morning before work I spread jam on the remaing base and topped with strawberries. I took it to work and cut individual squares and then kept it in one of those pyrex carry cases with the compartments for icepacks so it stayed cool all day. I'm barely getting this posted in time! I forgot all about the recipe until today and decided to throw it together. I didn't want to be like last month when I missed it and posted late. This month Kate chose Hazelnut Macaroon Sandwiches. I was nervous about making these because 1) I'd never made Macaroons before and 2) I don't get along so well with sandwich cookies. Luckily, the recipe was pretty simple. Everything was going well while I prepared this until I went to pipe the mixture on the parchment paper. I sort of missed the part where it says pipe MOUNDS. I guess I saw the word diameter and just assumed I was supposed to pipe circles. Well that certainly didn't work for me and I was annoyed so I decided to just take a measuring cup and pour the mixture on the baking sheet. So it really doesn't look like I have macaroons, I have flat circles. But they are still so good! I substituted ground almonds for the hazelnuts and it tastes great . The cookie itself is delicious, it's light and sweet with a hint of almonds. Add the chocolate ganache filling and it's just amazing. I'm looking forward to trying to make this again... the right way! Line 2 rimless baking sheets with parchment paper. Have ready a third rimless baking sheet, unlined. In the bowl of an electric mixer fitted with the whisk attachment, combine the egg whites and cream of tartar and beat on medium speed until the whites begin to thicken. Increase the speed to medium-high and beat just until soft peaks form. Slowly add the superfine sugar and continue to beat until stiff, shiny peaks form. Beat in the vanilla until blended. Using a rubber spatula, fold in the almonds and confectioners sugar until incorporated. Scoop the mixture into a pastry bag fitted with a 1/2-inch plain tip. Pipe mounds 1 1/2 inches in diameter onto the prepared baking sheets, spacing the mounds 1 inch apart. With a damp fingertip, gently smooth any pointy tips. Let the cookies stand, uncovered, at room temperature for 35 to 45 minutes. Remove the baking sheet from the oven, carefully lift the parchment, one end at a time, and sprinkle about 2 Tbs. water under the paper. Be careful that the steam does not burn you and that water does not splash on the cookies. (The steam loosens the cookies from the paper.) After 3 minutes, slide the parchment paper off the baking sheet, peel the cookies from the paper and transfer them to wire racks to cool completely. Turn half of the cookies bottom side up. Spread a thin layer of the ganache filling (about 1 rounded tsp.) over the cookie bottoms. I piped my filling in because the cookies were huge! Press a plain cookie, bottom side down, onto the ganache. Store the cookies in an airtight container at room temperature for up to 3 days. In a heatproof bowl, combine the chocolate and butter. In a small saucepan over medium-high heat, bring the cream just to a boil. Remove from the heat and immediately pour the cream over the chocolate and butter. Using a handheld whisk, stir the mixture until the chocolate and butter melt and are smooth. Let cool until spreadable. Thanks Kate for another great month! Hi Stacey-This is the 23rd of May and I just went in to your blog to see what's new. Surprised and "thrilled" to see the group at the winery for Ann's birthday celebration.. And for anyone else seeing this that birthday cake is fantastic!! Have a good one-love to you and Matt--G'ma M.
The post she's referring to is here. 1) I love that my grandma reads my blog and comments on posts. 2) You know if Grandma says a cake is good, it MUST be good. So everyone needs to make the Italian Birthday Cake! Ok, now on to cookies for breakfast. I saw this recipe for Peanut Butter Banana Oatmeal Cookies on Baking Bites recently and decided I needed to make it ASAP. Peanut Butter and Bananas make such a good combination I couldn't wait to try. The recipe is fairly simple and the cookies seem fairly simple but the taste is far from simple. One bite and I felt like I was eating a bowl of oatmeal with PB and bananas mixed in. I added some chopped honey roasted peanuts to add to the texture of the cookies and bring out the peanut flavor a bit more. The cookies are soft and chewy, similar to traditional oatmeal cookies, but the peanut butter gives them a bit more substance. Line a baking sheet with parchment paper. In a medium bowl, whisk together flour, baking powder, baking soda and salt.In a large bowl, cream together sugars and butter. Beat in egg until smooth, then mix in the peanut butter and mashed banana. Working by hand or with a mixer on low speed, blend dry ingredients into the peanut butter mixture. Stir in the oats and chopped peanuts. Shape dough into tablespoons and place on baking sheet, flattening each slightly with your fingers. Bake for 10-12 minutes, until cookies just begin to turn golden around the edges. Cool on a wire rack. Bakes approx 2 dozen. I got 2.5 dozen. 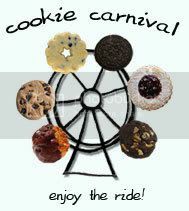 I missed Cookie Carnival last month and was really bummed out. I was so looking forward to making lemon bars. I don’t like lemon bars but really wanted to mess around with the recipe a bit. Even though I missed the carnival I decided to play along when I had time. Rather than just making “plain” lemon bars I made Pink Lemonade Bars using Strawberry and Lemon. 1. In the bowl of a food processor fitted with the metal blade, pulse the flour, sugar, almonds, and salt to combine. Add the cold butter in pieces and pulse until the dough comes together in a ball. This was my first time making dough in my food processor and it was so easy. It turned out sooo much better than using my blender. In a medium bowl, whisk together the eggs and sugar until smooth. Add the almond extract and flour, and whisk until smooth. Add the lemon juice and strawberry puree, and whisk to combine. 1. Pour the lemon strawberry filling into the prepared crust. Reduce the oven temperature to 325 degrees F. Bake for 30 minutes, or until the filling is firm and lightly golden. Remove to a wire rack to cool. The bars keep in an airtight container at room temperature for up to 2 days. For longer storage, wrap in plastic wrap and refrigerate for up to 5 days, or freeze well wrapped in plastic wrap and then aluminum foil for up to 3 weeks. Do not unwrap before defrosting. Dust with confectioners' sugar before serving. To check out the results of April’s Cookie Carnival, go visit Holly of Phemomenon who was the guest host this month. For more information on Cookie Carnival go check out Kate at the Clean Plate Club. I made this salad for dinner a few weeks ago and it was a big hit. It's based off a recipe I adapted from my friend Leslie. She made this for a shower a few months ago and from what I remember she couldn't keep the bowl filled. I made a huge batch so I was able to have this for dinner and a few lunches. It's a perfect summertime meal! Mix oil, sugar, worcestershire and vinegar to make dressing. Set aside. Put spinach in salad bowl and top of with strawberries, onion, almonds, walnuts, bacon, feta, and chicken . When ready to serve, pour dressing over the salad and then toss well with tongs. So I stopped blogging. Oops. And deleted all my photos on accident - thanks google+ :(. ....Baker. Cooker. Runner. Lifter. Swimmer. Reader. Teacher. Cyclist(er). Wife(r). The Best Morning Show Ever!